Kitesurf theory (“wind window” principle, weather acknowledge, wind directions and conditions for kiting). 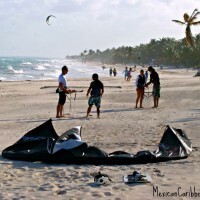 How to set a kitesurf equipment (kite inflation, bar and lines preparation for launching). Kite Control (how to fly a 4 lines inflatable kite on the beach). 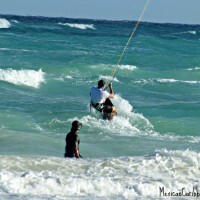 Launch and land a kitesurf on the beach with an assistance & the international kitesurf communication signals. Body Drag upwind (how to use the power of the kite to sail upwind using your body as a keel). Power Strokes (how to use all the power of the kite in the water). Water-Start with board (depending on the improvement and level of each student). Kite Control on the beach by yourself under your instructor supervision. The skills needed to enter and exit the water controlling the kite. Power Strokes for Water Start. Water Start with your instructor assistance. Once you have some board control, you will practice Water Star by yourself, being supervised by your instructor all the time from the shore. Normally to stand up confidently on the board some more hours of practice are needed. (Every student is different. This step depends not only on the student’s kiteboarding skills but on the water and wind conditions of the particular day). Kite control, Body Drag upwind & the kite techniques learned. Water Start in both directions. Practice board riding to achieve a consistent riding in both directions. Learn to determine the wind strength, direction and quality to ride. At the end you will ride properly, controlling the ride speed and respecting the right of way rule. Once completed this program you will be able to go to any beach, check the wind direction and power, decide the size of the kite and control all the other factors you need to kite without supervision. 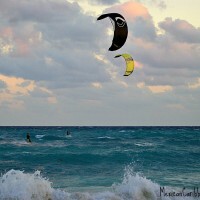 We love kiting as much as surfing. Why we have to choose if we can have both at once? So we specialized in Wave-Kitesurfing. BWS Noisepro kites and surfboards 2015. A course designed for total wave novices. 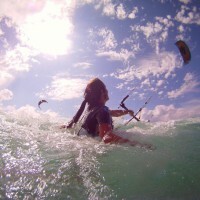 Kiters who want to learn how to kite in waves and how to ride an strapless board. We’ll introduce you to the surfboard and teach you how to ride waves with the kite. You will learn wave riding and strapless riding basic techniques. 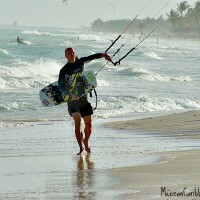 You will be guided by an experienced wave kitesurfing instructor with local knowledge. Prerequisites: you should be able to ride very comfortably with your twintip board. We are a professional kiteboarding school in Tulum (Mexico) with the latest kite gear 2015 BWSurf - Noise Pro and IKO certified instructors. The Caribbean waters, the white sand and the uncrowded beaches of Tulum are the perfect environment to learn kitesurfing. We are located at Ahau Tulum hotel beach, the coolest hotel and the perfect kitboarding spot for your vacations. We are Ben Wilson Surf Test Center in Mexico. We also offer Paddleboarding lessons, rentals, tours and SUP Yoga.